Whether you swim for exercise in a pool or you are planning a holiday to the sea, swim fins and flippers are the perfect accessories. Depending upon which water activities interest you, both come in a variety of styles to accommodate your needs. Swim fins have a shorter blade than flippers and are designed to produce explosive power from your kick. The blades come in different shapes like rounded, dolphin tail, forked or angled. 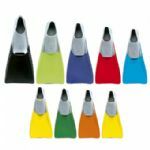 They are great training aides for swimmers and also make long distance swimming in natural settings more pleasurable. Swim fins are also used by bodysurfers and body boarders to produce the extra thrust power needed to get on a wave. Flippers have a longer blade than swim find and are great for snorkeling, leisurely swims and diving. The design of the longer blade allows you to get more thrust from slower, gentler kicks. Unlike swim fins, you travel slower in the water but you also exert less effort and travel farther. Flippers are great for snorkeling because the slow, easy glide does not frighten the fish and allows you to see more. If you always wear covered footwear or have soft feet, swim fins and flippers can cause chaffing around your ankles. A good way to avoid this is to purchase a pair of swim socks which will keep your feet protected. If you plan on wearing swim socks you may need a larger size fin so plan accordingly. 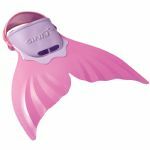 Swim fins and flippers are a wonderful addition to your aquatic workout routine. Both help swimmers improve their ankle flexibility, kicking strength plus they allow you swim faster while you practice. For casual swimmers, swim fins and flippers make the experience a lot easier. 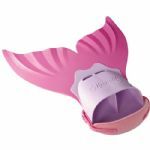 For improved conditioning, water safety and fun, swim fins and flippers are a great choice.